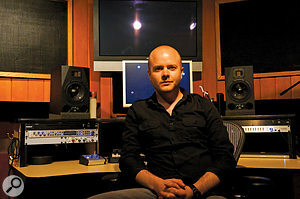 Top producer RedOne has had hits with dozens of artists, but relies on one man to "finish” tracks like Nicki Minaj's 'Starships': engineer Trevor Muzzy. In recent years, Nadir Khayat, aka RedOne, has been involved in the writing and production of several dozen international hit songs by the likes of Lady Gaga, Jennifer Lopez, Pitbull, Enrique Iglesias, Mika, Nicole Scherzinger, Mary J Blige, Usher, Akon, Nicki Minaj, Alexandra Burke and many others. The Moroccan-born Swede moved to the US in 2006, and currently lives in LA, where he works up his tracks in several studios, aided by Team Red, a group of additional songwriters and producers and one engineer, mixer and occasional guitarist. The engineer, mixer and guitarist in question is called Trevor Muzzy. Since joining RedOne's team in 2009, Muzzy has worked on almost all the producer's major hits, and was nominated for a 2012 Grammy for his work on Lady Gaga's Born This Way album. This year alone, so far, RedOne has had three major 2012 US and UK hits. Muzzy engineered parts of Far East Movement's 'Live My Life', mixed Jennifer Lopez's 'Dance Again', and recorded and edited vocals for and mixed Nicki Minaj's 'Starships', as well as the other three songs RedOne co-wrote and co-produced on Minaj's recent US and UK number one album Pink Friday: Roman Reloaded. To RedOne and his team, Muzzy's role is not so much that of a traditional mix engineer, but someone whose job is to "finish” songs. "It is semantics, really, but we use the word 'mixing' less and less, because recording engineers and producers are mixing as they go,” explains Muzzy. "The process is very different from even a few years ago, and the lines are increasingly blurred. When you're working with a great producer, you don't start from scratch when you mix one of his or her tracks. You don't want to remove the magic that's already there. A lot of mixers focus on what's bad about a track, but I feel that it's important to focus on what's good already and do my best to enhance that. I think it's the wrong approach to change it just to put your stamp on it. The main thing when you start a mix is to identify the intention of the song and the producer and the artist, and then you take it from there. Nicki Minaj's 'Starships' is characteristic of RedOne's production approach, marrying a Euro-dance feel and a four-to-the-floor bass drum with strong, radio-friendly melodies. As is typical of today's hits, the song was written by a large group of songwriters consisting of Minaj (Onika Maraj), RedOne, two other LA-based Swedish producers/songwriters, Carl Falk and Remi Yacoub, and well-known UK song writer Wayne Hector. Perhaps for this reason, the song is made up of several distinctly different sections. An electric-guitar intro played by Carl Falk leads into a rap verse, followed by a sung pre-chorus, the chorus itself, and a breakdown section with vocal and other effects. Muzzy was not party to the writing, programming and arranging of the song but, once these were done, was asked by RedOne to track Nicki Minaj's vocals. "RedOne is very particular about the way he wants the vocals to sound, so he wants someone to record them who knows his approach. It's a stylistic thing, which inflections to emphasise, small details that help enhance the vocals. All Nicki's vocal tracking was done at Conway Studios in LA, where she had a lockout and was working with her engineer, Ariel Chobaz. I did not want to assume that how he was recording her wasn't working, so I asked him what he had set up, and he told me that there were two vocal signal chains, one being a Telefunken ELAM 251 going into a Chandler TG2 mic pre and then through an Urei 1176 [compressor]. The other was a more traditional Neumann-Neve chain. The 251 chain sounded amazing and worked really well with the 1176, which I don't typically use for cutting vocals. It gave her voice a unique character with a cool edge that wasn't there with the other chain. We cut Nicki's vocals in a day, and I came back and we redid a few things, so you could say it was a two-day process. "The first step in starting a mix, whether I have an assistant helping me or not, is to organise the session and lay it out in a way that makes sense to me. For me. the most important thing is to group things in sections and colour-code all regions. 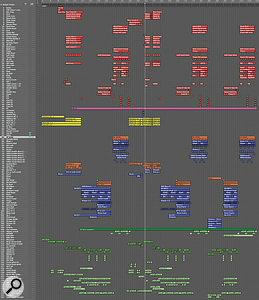 As you can see in the 'Starships' session, I'll have the drums in red, the guitars in yellow, basses in orange, synths in blue, lead vocals in dark green and background vocals in light green. This composite screenshot shows the Logic Arrange window for 'Starships', as organised and colour-coded by Trevor Muzzy. Drums, at the top, are red; electric guitars in yellow; synth basses in orange and other synths purple; and lead and backing vocals in dark and light green respectively. 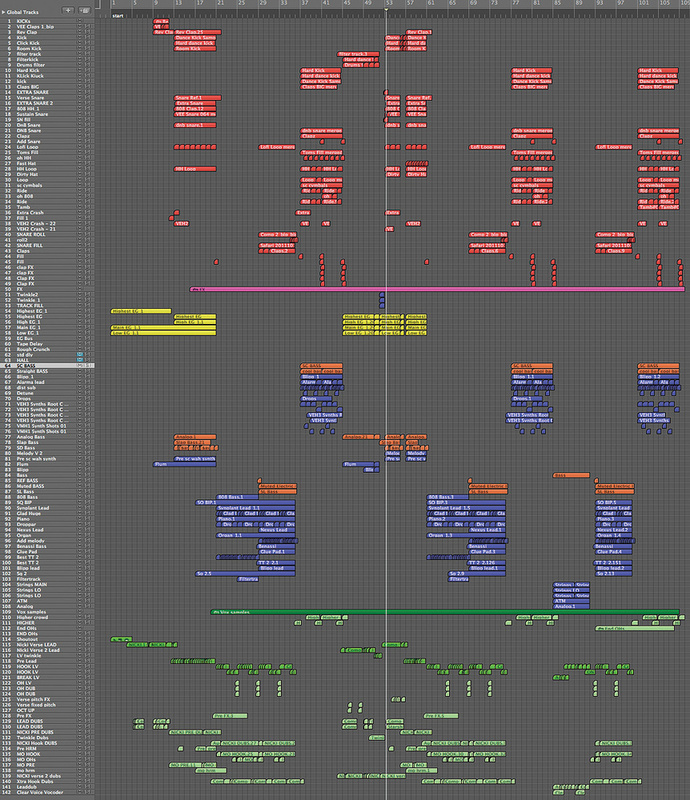 The pink track is a folder track with the sweeps and transition effects between sections. In this session, I labelled the individual vocal tracks, because the vocal sound changes throughout the songs and things come in and out. So every section has a different channel. I also combined the basses and the synths for each section. In dance music, the separation between bass and synths is increasingly a grey area. Some guys don't even look at the difference any more, as the lines have come completely blurred. But I did mark the basses in orange and synths that are more 'music' sounds in blue, because I find it helpful to separate the main low-end sounds in the track, so I can check how they work together with the kick. In dance tracks, the kick has to hit really hard, and I need to be able to quickly adjust what is happening with the bass sounds to make sure that there's room for the kick. "In terms of how I approached the mix, when you're working with dance-orientated songs, the first thing that grabs you is the feel of the drums. So I tend to begin with the drums and maximise what's there. I generally start with the kick, and then the snare, and then I listen to how the drums sit together and how the transitions between the different sections are happening. I don't try to get the drums perfect at this stage. Once they're in the ballpark, I'll bring in the basses. As I said, the track was already pretty well mixed and together, so I fairly quickly brought in the other elements, like the guitars and the synths, and then I muted sections, treating the drums as one unit and the synths as a whole unit, and all the time thinking of the big picture. I listen to how the synths are sitting with the basses and how the basses are sitting with the drums, and so on. It's almost like working with stems. After this, I bring in the vocals. "The drums, which were all programmed, were already sitting really well in this session when I began the mix. Sometimes if the kick is lacking in punch and is swallowed up a bit too much by the bass, you have to really work to give them each their own place in the mix, typically by side-chaining the bass to the kick, and emphasising the punchy areas of the kick with EQ and/or compression. Often, when a track has only one kick sound you have to give it more of its own identity, so it has its place. But in this track that was not a problem. The kick is really punchy, it's a hard dance kick that also has a nice old-school warmth to it. It's a very organic-sounding beat for a dance record, which is a testament to the samples that were picked. Because the kick, and also the snare, were made up of several layered sounds, with one of them giving the body of the sound and another would have a clicky high end, and so on, my work was about balancing the different layers so that they sounded right in the mix, rather than applying loads of effects or EQ. "The 'Vee claps' track is called that because it uses a sample from the Vengeance Electro sample pack. I balanced the different snare sounds in a similar way as I had balanced the kick layers. I did apply EQ to a couple of the snare layers, just to give them a little bit more identity, like on 'Extra Snare 2', I cut out all the low end and a little bit of the top end as well, so it became just this high-mid click. The rest of the drums were simply a matter of going through each of the sounds, making sure all samples sat well together, and filtering anything that I felt was in the way. All the drums are also going to an aux track with the [Audio Ease] Altiverb on it, to give them some ambience, and that was all.” The same Altiverb preset was used both for the drums and for the vocals. 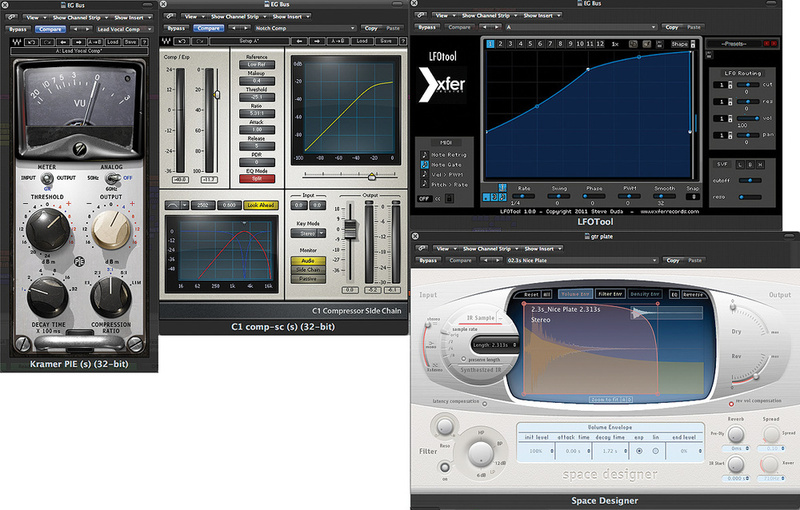 Guitars: Waves Kramer PIE and C1, Xfer LFOtool, Logic Space Designer Trevor Muzzy often prefers to use frequency-conscious compression instead of EQ when dealing with problematic frequencies. 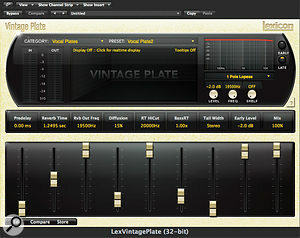 His plug-in chain for the electric guitar incorporates a Waves C1 for this purpose, a Waves Kramer PIE plug-in and XFER's LFOtool for pumping compression, and a Logic convolution reverb. Vocals: Logic Pitch Corrector, Channel EQ and BitCrusher, Waves C1, SSL Channel, Renaissance Channel, De-Esser, Renaissance Compressor, API 2500, CLA Vocals, Doubler and VX1 Maserati Vocal Enhancer, Audio Ease Altiverb, Lexicon PCM Native Reverb There were lots of vocal tracks in the 'Starships' session. As you can see from this Logic screen capture, the lead vocal tracks (left) had extensive Logic Channel EQ as well as heavy plug-in processing. 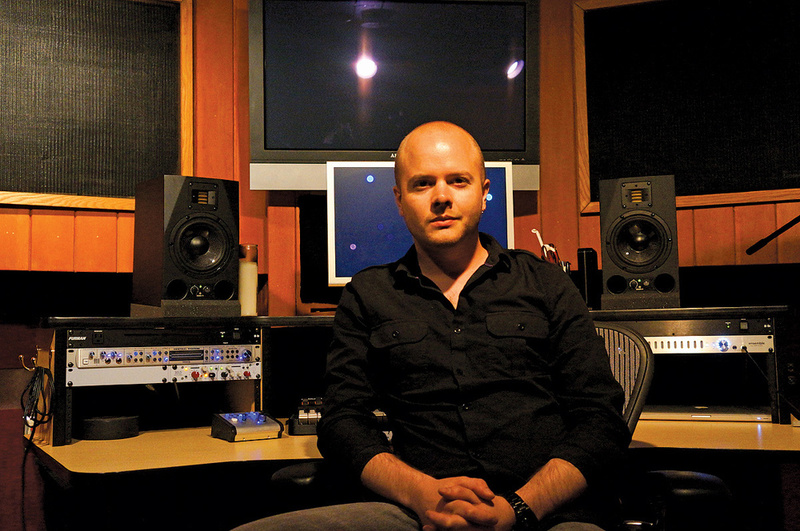 "You can see that the pre-chorus and chorus vocals have a lot of timing and comp edits. They were imported directly from the session I cut the vocals in. I did not merge or consolidate them, they just are the way they are. There's quite a lot going on with the vocals. I tried to create a nice basic vocal sound using the inserts, and once they sat well in the track, most of the sonic variations between the sections came from the sends. There was no tuning on the rapping, but the sung vocals in this track had a fair amount of tuning with the Logic Pitch Corrector plug-in on the inserts. The tuning is part of the sound of the record, with vocals needing to be very, very precise. In some cases, we pitched them up or down for vocal effects. Logic Pitch Corrector is a little harder-sounding than Auto-Tune, but it has its own distinct sound that we liked for the vocals in this track. It really fits the song. "The other inserts on most of the vocals were all Waves: the C1 compressor, SSL Channel, Renaissance Channel, De-Esser, Renaissance Compressor, API 2500, and the Logic Channel EQ. The C1 compressor is the first in line on several lead vocals, and it does the same Pensado trick I used on the guitars, which is to compress a specific band — in the case of the verse lead vocal, around 2849Hz — focusing on notes that sounded a little harsh. It smooths this problem out more elegantly than using an EQ. Then the signal goes through the R Channel with some basic EQ, cutting significantly at 281Hz. Again, it was a matter of removing some less pleasant things to let the nice aspects shine. I bypassed the compressor in the R Channel. I needed a bit of de-essing, and the Waves De-Esser is a great all-purpose de-esser, in this case working at 5634Hz with the side-chain set to high-pass. "There were two more compressors on her vocal. There was no science behind this, it was just a matter of experimenting to find a unique sound. The first is the Renaissance Compressor, which I love and which is set to a fast attack time and takes off about 6dB, so quite subtle, not too intense. The API 2500 is set pretty aggressively and you can hear it pumping a little bit on the vocal. It was already in the session — it had been used on the demo vocal. I pulled it over to Nicki's channel and liked what it was doing, so I adjusted it to fit her vocal. Finally, the Channel EQ notches quite a lot around 600Hz and a little bit more around 235Hz, just carving out some low-mids to make the vocal sit better in the track. "Regarding the sends, there are some really distinct things happening here. The main lead vocal was similar throughout the song, but I tweaked it as it went along. The pre-chorus and chorus vocals all have Bus 1, which went to the same Altiverb effect that I had on the drums, to add some ambience to the vocal. The rap verses are much drier. 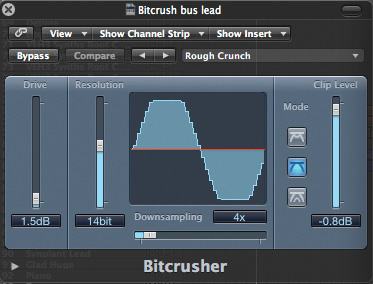 Bus 35 is the Waves Doubler, which gives a bit of spread to the lead vocal — I used this on the rap as well as on the sung vocals. Bus 4 is the Waves CLA with a drastic telephone effect. That was another effect that was there from the demo version and added a cool quality. 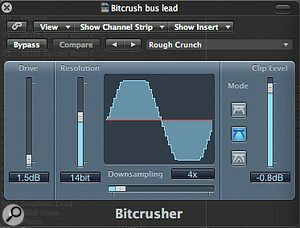 Bus 50 is the [Sound Toys] Echo Boy, which is the main plug-in I use for delay throws, whenever I want to repeat a word. In this case it's on a quarter-note Echoplex setting. It's a single, mono echo that I panned a little bit to the side. Bus 7 has the Waves VX1 Maserati Vocal Enhancer, and that was, again, a plug-in I inherited. It is set to a very compressed, bright vocal sound that I brought in and out to add some sparkle to the sound when necessary. 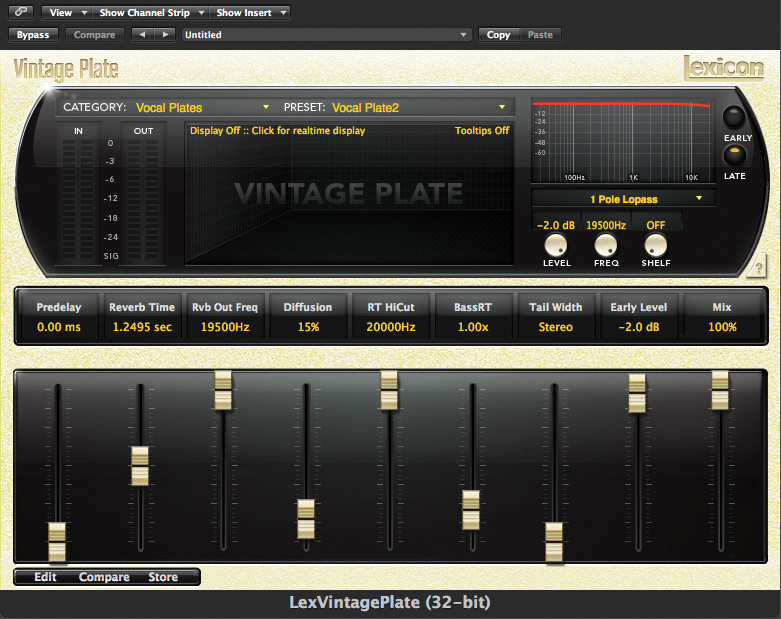 Among the more important of the many plug-ins used on Nicki Minaj's vocal were the Logic Bitcrusher and a bright plate reverb from Lexicon's PCM Native Reverb. Trevor Muzzy's rise to the top has been remarkably quick. He took up the bass as an adolescent in the Bay Area, before attending a degree course called 'Interdisciplinary Computing In The Arts', with a focus on music, at UCSD in San Diego. (Muzzy: "It was a technical arts programme, a bachelor's degree, with a focus on anything from music theory to engineering to writing VST plug-ins.”) During his course, in 2005, he studied for five months in Sweden, but it wasn't until 2009 that he met his current employer.